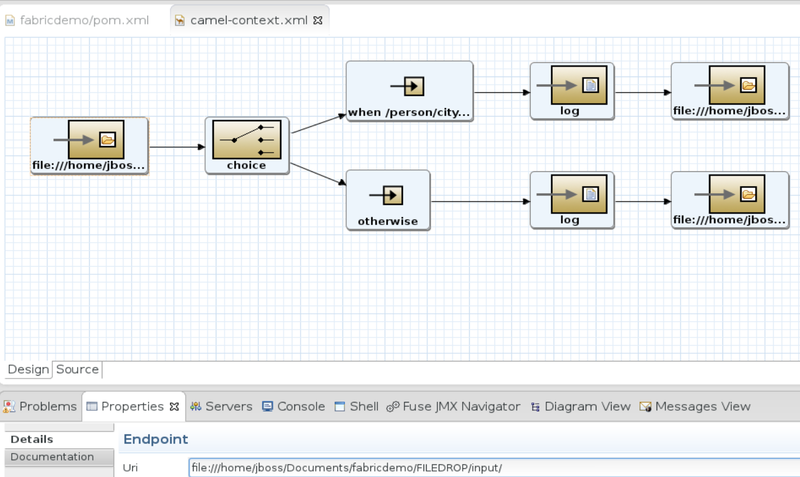 One of the great features of Jboss Fuse and the underlying Apache Camel is that it can be deployed virtually anywhere. However one of the runtime possibilities that comes out of the box with Jboss Fuse is Fuse Fabric, which uses fabric8 containers as a runtime. In fabric8 the deployable unit is a fabric profile. In this post we will create a fabric profile containing a Jboss Fuse project. Then we will create and startup a fabric container and provision this container firstly with the Jboss Fuse runtime and finally with our fabric profile containing a camel route. We will use maven for most of the build and deployment steps. 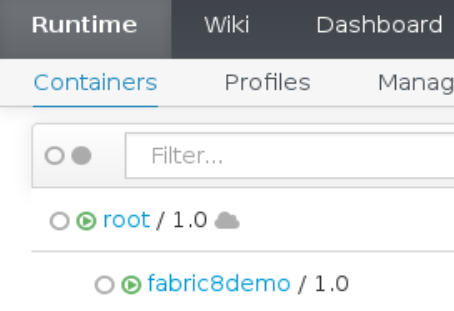 Note this post will not go into detail how to setup your fabric8 environment and assumes you already have a running fabric with a running root container. As mentioned above we are using the Fuse spring example which you get for free after creating a Fuse project using the spring archetype for Fuse. The only thing I changed in the Camel route of this example is the location of the directories used for reading and writing the files. I changed it so it no longer uses a directory in the project but just some location on my file system for quick testing. We are going to deploy the project containing this route as a fabric profile. This fabric profile can than be added to a fabric container which, in this case, acts as a karaf runtime for Fuse. We are going to use maven for all the build and deploy steps. To use an OSGi bundle we need to change two things in our pom file. Next up is adding the fabric8 stuff to our pom file. This contains a the fabric8 plugin adding some fabric8 properties and removing the existing maven plugins. finally we need to remove the existing maven plugins so no conflicts can arrise using the fabric plugin. Now we are ready to deploy our Fuse project as a fabric profile making it available in fabric8. [INFO] No profile configuration file directory /home/jboss/workspace/fabricdemo/src/main/fabric8 is defined in this project; so not importing any other configuration files into the profile. Now we can switch to Hawtio for finalizing our deployment and starting our application. We assume you have already created a fabric and your server is running. Now we can switch to hawtio to finish up the deployment. Go to localhost:8181 (or, when using a remote server to the server address) to start up the hawtio console. 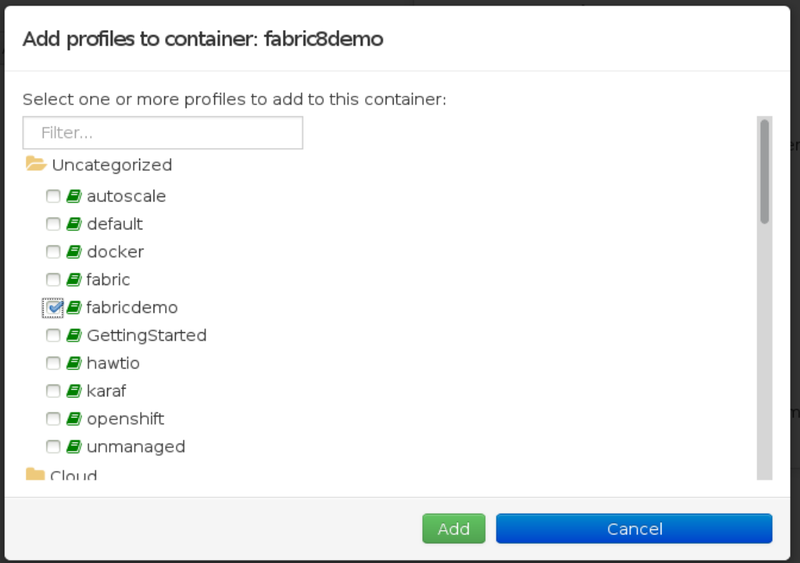 now click the create button to create a new container which we will use to deploy our newly created fabric profile into. however we still need to provision this container with the fabric profile we created earlier. Note the little Camel after Services and the camel in the JMS Domains. Now our Fuse project is correctly deployed and running in a fabric8 container. To open the container simply click the Open button and the Hawtio console of the container will open in a new browser tab. When we go to the Camel tab we can expand the route we have just deployed to see how many messages the route has processed. After some test messages it seems our route is working!